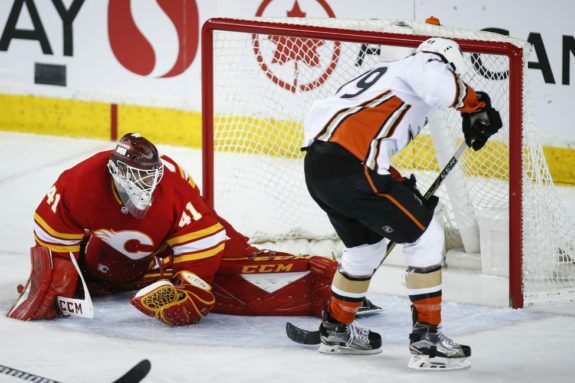 CALGARY — Sean Monahan scored twice to set a new career high in goals and also added two assists, leading the Calgary Flames to a 6-1 win over the Anaheim Ducks on Friday. Monahan entered the night with two goals in his last 19 games, but he broke out with a big game offensively and is up to 33 on the year — surpassing his previous career best of 31 goals. Mark Giordano, James Neal, Derek Ryan and Garnet Hathaway also scored for Calgary (48-23-7). Seeking their first division title since 2005-06 and first conference title since 1989-90, the Flames extend their lead atop the Pacific Division and Western Conference to eight points over San Jose. The Sharks have five games remaining including a home date with Calgary on Sunday. Andy Welinski, with his first NHL goal, scored for Anaheim (32-27-10). The injury-ravaged Ducks, already eliminated from playoff contention, are 1-1-1 on their four-game road trip, which wraps up Saturday night in Edmonton. Tied 1-1 after the first period, Calgary took its first lead 3:37 into the second when Monahan knocked in Rasmus Andersson’s rebound. A two-time 31-goal scorer previously in his career, Monahan had been stuck on 31 goals since March 12. Just over six minutes later, Monahan’s shot from the slot deflected off Neal and past Ryan Miller for a power-play goal, making it 3-1. The goal snapped a 0 for 21 skid for the man advantage over the previous eight-plus games. Mike Smith got the win with a 21-stop performance. He improves to 22-15-2. Smith’s biggest stop was a breakaway save off Max Jones in the first period, just seconds before Giordano tied it at 15:32. At the other end, Miller finished with 31 saves. He falls to 7-7-2. Calgary put the game away in the third period with Ryan neatly deflecting in TJ Brodie’s shot at 8:07, Hathaway scoring his 11th goal at 14:37 and Monahan capping the scoring at 19:14. Not realizing that a goal earlier in the game, credited to Monahan, had been changed to Neal, a number of hats were thrown onto the ice after what the crowd thought was his hat-trick goal. Notes: Monahan’s first goal ended a stretch of 156:12 without a goal from a forward… Calgary departs on a three-game California road trip before finishing the season at home against Edmonton next Saturday… Flames inserted Dalton Prout on defence for Oscar Fantenberg… Anaheim has lost 407 man-games to injury. Calgary has lost 130.